Twelve civilians are reported to have been killed in a Saudi-led coalition air strike in north-western Yemen. Residents and an official said the victims were travelling in a pick-up truck that was targeted in the Hiran district of Hajja province. They had been heading to a local market, according to the residents. There was no immediate comment from the coalition, which is fighting the Houthi rebel movement in a bid to restore the internationally recognised government. The coalition says it does not target civilians, but the UN says air strikes have caused the majority of the more than 4,125 civilian deaths recorded since the conflict in Yemen escalated in March 2015. Wednesday's incident comes two days after a 48-hour cessation of hostilities ended. Both sides accused each other of repeated violations of the truce, which brought a brief respite from air strikes for residents of the rebel-controlled capital, Sanaa. Fighting continued in and around the south-western city of Taiz throughout the weekend, however, and on Tuesday clashes there reportedly left 11 people dead. Military officials said pro-government forces had repelled an attack on Taiz's western outskirts by Houthis and allied security personnel loyal to former President Ali Abdullah Saleh. The International Committee of the Red Cross expressed alarm on Tuesday at the situation in Taiz, where some 300,000 people have been under siege by rebel forces for more than a year. "Sniper fire and indiscriminate shelling has trapped civilians. Dead bodies are in the streets and people are unable to attend to their most basic needs. 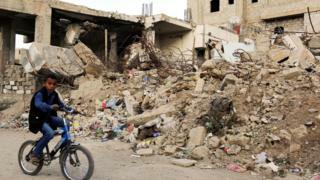 The situation is desperate," said the ICRC's head of delegation in Yemen, Alexandre Faite. Mr Faite added that the main hospitals in Taiz had reported receiving an average of 200 wounded in three days. Many patients were suffering from blast injuries and had to have limbs amputated.